The students of Mother of Providence School in Wallingford, and their teachers, show their poems which they read a recent competition in Delaware County. 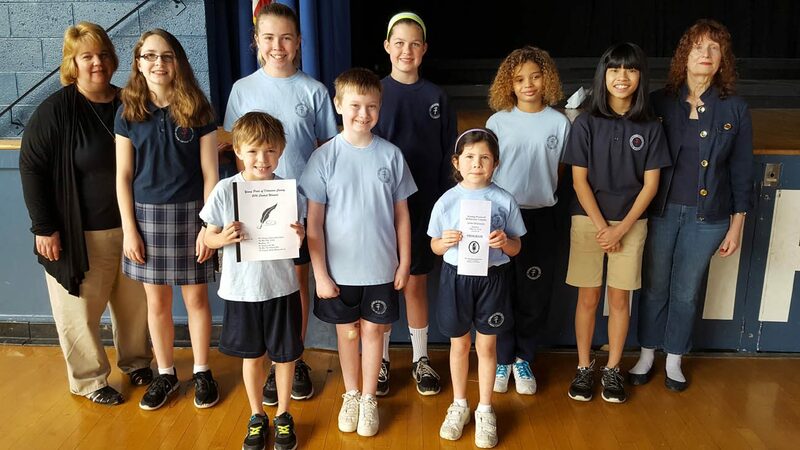 Nine students of Mother of Providence Regional Catholic School, Wallingford, read their prize-winning poems to a supportive audience at the Delaware County Poetry Competition held May 15. The competition was sponsored by the Delaware County Library System and the Mad Poets Society, and held at the Redwood Community Playhouse in Upland Park. I like my tooth and it isn’t tight. I wiggle it all day and night. I am as lucky as can be. Soon the tooth fairy will come to me. Oh in a tick and a tock a coin under my pillow there will be. I can see the waves moving fast. The wind blows gently through my hair. I can feel a cool mist in the air. And it’s sad to see the journey end grow near.